I wish people do research with any animal before getting them, it is so easy now to find information online but a lot of people just go straight and buy the animal, and many times the animal suffers for the mistake the owner made and the owner would probably just by something else to kill. Well this looks to be pretty bad for the cham. I hope they took it to the vet. I agree that people need to do the research before buying any pet and especially reptiles since there is a lot more to gutload and dusting that gets overlooked. My problem is the price of veild chameleons. People buy them since they are so much cheaper and billed as super hardy (for a chameleon). I bought mine because I was too afraid to put the money down for a panther with no chameleon experience. That doesn't mean I didn't do the reasearch first but I feel the price of these gives people the idea that oh well it didn't cost much so if it dies I'm not out a ton. Stupid mindset for a delicate animal. 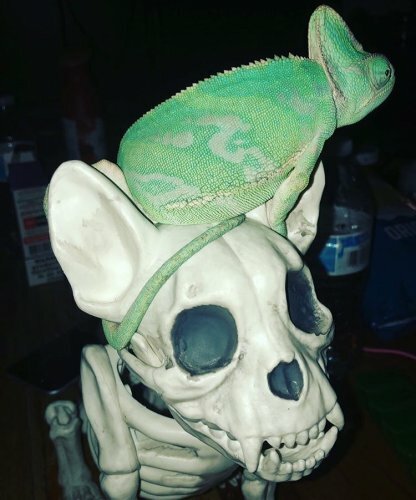 Also the topic was brought up in the chameleon breeder podcast and he said he finds that people don't want to spend more on the cage then they did on the animal. We all know that $50-$80 is nowhere near enough to scratch the surface of basic needs of a cham. I just wish the price of all chams were in the realm of panthers. I think it would keep the people from taking a chance. Any updates? Such a beautiful animal. She seems in need of immediate medical attention. I hope a vet had a chance to intervene. Keep us posted. My roommate had a female veiled about the same age. She started showing signs of being gravid but my roommate didn’t get her a laying bin and sand in time (my boyfriend and I actually had to buy it because she literally just wouldn’t. It was like she didn’t care anymore.) But it was too late, and she was already egg bound. Within a few weeks, she stopped eating, stopped defecating, and wouldn’t open her eyes. I stressed to her every day that she needed to get her to the vet or she was going to die but she had the excuse of “I don’t have the money for that” every time. We got into a huge fight about it one day, and that night while my roommate was out her Cham’s tail turned stark white before she proceeded to throw up what ever hadn’t digested from the last time she ate. She smelled like death. I held her in a towel and a heating pad for a few hours before she finally died. (it was around 3-4am). It broke my heart. This is why we research the animals we look into getting. This is why we don’t impulse buy. One of the last photos taken of her before she got to the point where she wouldn’t even come out of her cage anymore.